President-elect Donald Trump ditched his stocks in June. He sold "all" of his holdings then, according to Jason Miller, the transition team's spokesman. He had warned of a stock market bubble for months. "We're in a bubble right now," Trump told The Hill in October 2015. We're "in a big, fat, ugly bubble," Trump said again in the first presidential debate in September. It's unclear why Trump sold when he did. He himself said he "got out" of the market in an August interview with Fox Business. But since July 1, U.S. stocks are up 5%. Verifying that Trump really did sell all his stocks is difficult. His last financial disclosure came in May 2016 -- a month before Miller says Trump exited all of his stocks. Legally, Trump isn't required to submit another disclosure to the Office of Government Ethics until May 2018. However, all other presidents have voluntarily disclosed their financial holdings in their first year in office since the Ethics in Government Act passed in 1978 in the wake of the Nixon scandal. 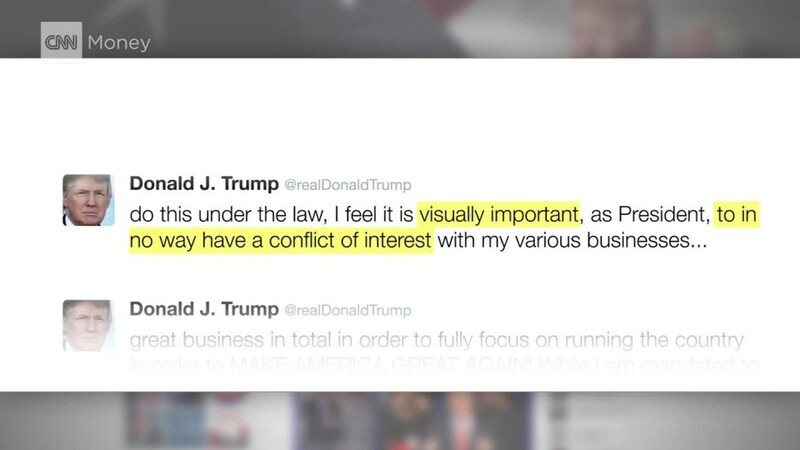 Trump has already come under fire for mixing business and presidential politics. Many are calling on him to fully remove himself from his business empire as he prepares to enter the White House. "We don't really know what he is, and is not invested in. I don't think anyone ever contemplated these kinds of conflicts for a president," says Jeff Hauser, executive director of the Revolving Door Project. Earlier this year, Trump disclosed that he owned 100 individual company stocks, including Apple (AAPL), Microsoft (MSFT), Pepsi (PEP)and GE (GE). He also held stock in Boeing (BA), a company he blasted Tuesday. Trump says he wants to cancel Boeing's contract to build a new Air Force One plane because costs are "out of control." In his May disclosure, Trump listed the size of his stake in Boeing as between $50,0001 and $100,000. Boeing stock dropped sharply after Trump's comments but has since rebounded as the company fought back, saying the president-elect's figures aren't correct. Trump's individual stock holdings from his disclosure added up to a mere $10 million -- a small fraction of his overall business empire. He also reported over $80 million in hedge fund investments. Trump's transition team did not respond to CNNMoney's inquiry about whether Trump also sold his hedge fund holdings in June. The U.S. stock market has rallied about 4% since Trump won the election. There are other ongoing questions about what the Trump Organization holds. Trump has promised to turn over control of his business to some of his children.